The summer Olympics has been so exciting for us this year! We have enjoyed watching the events every day, and learning as much as we can about the culinary world of Brazilian food. 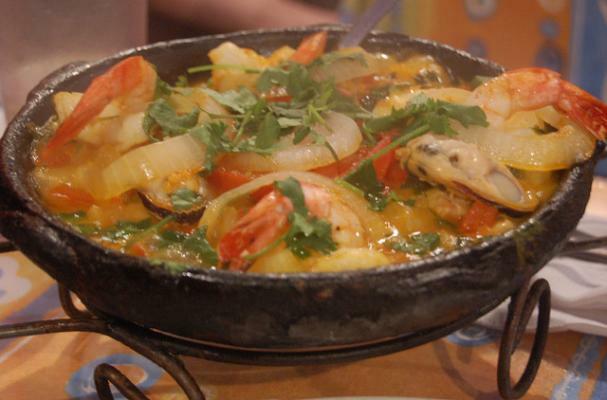 Recently, we discovered this luscious seafood stew. Deeply seasoned, with coconut milk to make it creamy and rich, this soup is simply satisfying. Flavors include jalapeno, lime, and garlic combining into an explosion of flavors. Although you can substitute water, please do try it with fish stock. Serve it over rice with a wedge of lime to get the true, authentic flavor. The most classic of Brazilian cocktails, this muddled sugar and lime treat includes Cachaca, a Brazilian liqueur. Accept no substitutions, but try it with strawberries too. Divine!